Improved on A-100 to AC-1890 Chassis. Since the initial release of A-Line vehicles, various improvements have been made to the clutch pedal linkage and clutch control linkage used on these model vehicles. These improvements to the clutch pedal and control linkage have reduced clutch pedal effort, overcome abnormal loss of clutch pedal free travel, and provided improved clutch disengagement. rod and turn buckle to a one piece control rod, Fig. 1, With this type linkage, pedal adjustment is accomplished through use of an offset adjustable yoke on the control rod. NOTE: On some chassis, the offset yoke is located at the release lever end, while other chassis have the yoke located at the clutch pedal end. 2. Clutch pedal free travel reduced from 2" to l-7/16". the previous bracket with bolt, nut and washer, Fig. 2 AC Models only. 4. New design clutch release lever on A-100 thru A-l8O series chassis. parts are designated with an asterisk. On chassis in service where high clutch effort or loss of clutch pedal’s free travel is being experienced, the new clutch linkage and component parts a listed in parts list and shown in Figs, 1 and Z, can be installed. If old parts of clutch linkage not affected by this change show indication of wear it is advisable to also replace these parts at time of clutch linkage modification. 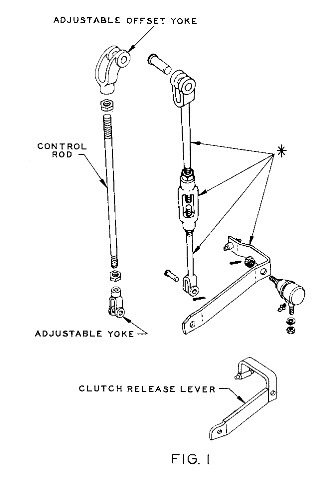 The clutch pedal is mounted on a cross shaft and utilizes two nylon bushings and requires no lubrication. To obtain matching level or height of clutch pedal with brake pedal, adjust pedal stop retainer located on support assembly. The slotted hole in the support assembly allows for sufficient adjustment to bring the clutch pedal to the same level as the brake pedal. A change in clutch pedal height may require a pull back spring adjustment and pedal free travel adjustment. 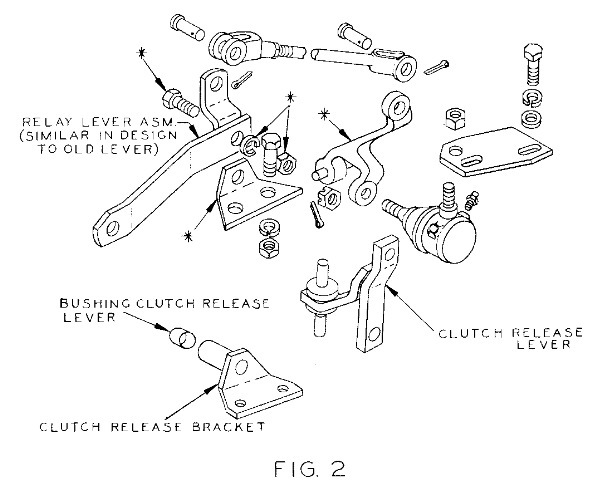 clutch pedal or relay lever and loosen lock nut on end of adjustable yoke. clockwise to decrease free travel. Tighten lock nut after adjustment. both will be provided for service upon order. It is our belief that every customer is entitled to and shall receive two distinct services ..
one from the product itself and the other from the organization back of it. This entry was posted in IH Service Letter. Bookmark the permalink.